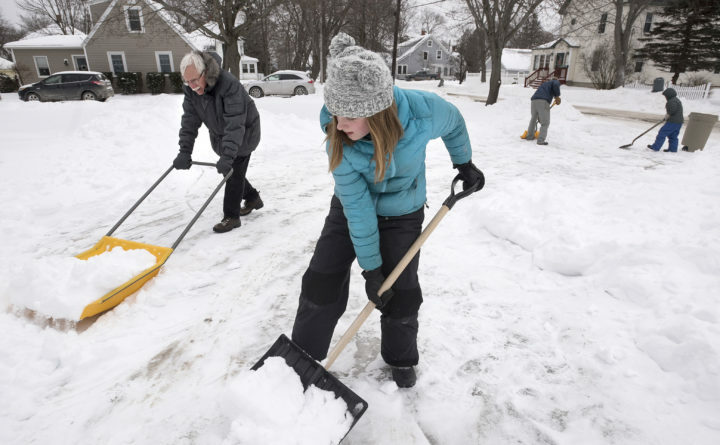 Jaeda Grosjean, 13, (center) and her grandfather Clyde Baker shovel snow from a relative’s driveway in Bangor, Jan. 21, 2019. This latest storm will drop another 4 to 6 inches over Greater Bangor, according to the National Weather Service office in Caribou. Similar snowfall is anticipated for most of central, eastern and northern Maine. Snowfall will start by 3 a.m. Thursday over Greater Bangor, a 4 a.m. start time for Millinocket and central Penobscot, according to the weather service. Snow will start to fly Down East by 5 a.m., and snow will begin coming down in Aroostook County by 7 a.m. The storm comes on the heels of two batches of snow last week, including a Wednesday storm that left 9.5 inches of snow over Bangor and north of 10 inches over northern Penobscot and Aroostook counties. Friday’s storm left a dusting by comparison, with only 1 inch dumped over Bangor. The highest reported snowfall from that storm was 4 inches in Houlton, according to the weather service.